Chesapeake Country lies along the migratory corridor known as the Atlantic Flyway. It is well known for its migratory long-legged waders, geese, and ducks, as well as numerous resident bird species. This region of the Delmarva Peninsula is home to the largest concentration of nesting ospreys on the Eastern Seaboard and provides winter habitat for Tundra Swans. Birders and nature lovers alike will find the rural landscape, numerous wildlife refuges and management areas ideal for extended birding or nature opportunities by car, foot, bike, kayak, or canoe. Bring your camera and binoculars! The Chesapeake Country offers great opportunities for exploration! Numerous restaurants are open for lunch in South Chesapeake City. Be sure to pick up a walking and shopping guide of Chesapeake City as well as discover other Southern Cecil County attractions along the Byway. Historic Inns and B&Bs await you should you choose to extend your stay in Chesapeake Country in southern Cecil County. Canal Wildlife Management Area: This management area was created by the stupendous volume of earth dredged from the making of the Chesapeake & Delaware Canal. It resulted in heaped banks creating high bluffs that slope steeply down to the ribbon of water that parts the land. Running along the bluffs are a series of dirt roads that one can travel by car, bike or foot to appreciate the immensity of this engineering project while viewing birds and wildlife that have made this habitat home. Drive South on Route 213 from Chesapeake City, Turn onto Court House Point Road which leads to the WMA. Courthouse Point Wildlife Management Area: This isolated area is noted for its winter water fowl, and for summer terns. The agricultural areas are habitat for Northern Harriers, Horned Larks, American Pipits, Vesper Sparrows and numerous other species. Return to Route 213 South, turn onto Glebe Road, then onto on Schoolhouse road to enter the WMA. Earleville Wildlife Management Area: This 190 acre tract is ideal for upland game viewing and seasonal hunting. The area also hosts a number of bird species which are counted annually during the Christmas bird count held by the Maryland Ornithological Society. Fall and spring migration bring warblers and small land birds to this area as well as American Pipits. The area is also noted for its populations of wood ducks, Bobtail Quail, and Wild Turkeys. Another similar area nearby is Stemmer’s Run WMA off of Pond Neck Road and Stemmers Neck Road. The driveway to Mount Harmon Plantation can be found off of Grove Neck Road, just down the road a piece from Stemmers Neck Road. Mount Harmon Plantation at World’s End: All 200 acres of this colonial plantation are a designated nature preserve. Nature trails twist and turn into creeks and inlets of the Sassafras River. Wildlife is abundant in the woods, fields, ponds, and creeks throughout the plantation. A pair of American Bald Eagles nest in the vicinity and can be seen hunting over the plantation. Suggested Time Spent at Site: 2-3 hours. Admission fee. Turner’s Creek Park & Sassafras River National Refuge Management Area: This 146 acre park and adjacent river are prime habitat for waterfowl and many other species. The park consists of trails, old roads, fresh and saltwater ponds, wooded ravines, farm fields, and a variety of forests for a valuable nature experience. Return to the Byway into Chestertown and take Route 20 West towards Rock Hall. You will see signs along Route 20 for the next destination after you pass the turn for Route 21. Chesapeake Farms: The 3,300 acres of Chesapeake Farms are devoted to the development, evaluation, and demonstration of advanced agricultural practices and wildlife management techniques, which are designed to be environmentally sound, productive, economically viable, and socially acceptable. There are 16 stops along this self-guided tour which is open to the public during daylight hours from February 1st through October 10th. The wetlands provide habitat for wood ducks, ospreys, great blue herons, and other water fowl. Juvenile eagles are more commonly seen at the farm than adults. Return to Route 20 West and turn South onto Route 445 until you enter Eastern Neck Island NWR. Eastern Neck National Wildlife Refuge: The 2285 acres of this refuge is an island at the confluence of the Chester River and the Chesapeake Bay. It hosts a number of different habitats including 1000 acres of tidal marsh, 600 acres of upland forest, and 600 acres of croplands. The refuge serves as an important migration stopover and wintering area for thousands of waterfowl representing nearly 3 dozen species. These include: Canada geese, tundra swans, canvasbacks, mallards, widgeons, ruddy ducks, black ducks, lesser scaups, buffleheads, pintails, oldsquaw, scoters, and a diversity of other waterfowl. Great blue and green-backed herons, and great and snowy egrets frequent the marshes and mud tidal flats. Numerous marsh and shore birds including killdeer, yellowlegs, sandpipers, and woodcock can be seen spring through fall. The refuge also provides habitat for the endangered Delmarva fox squirrel. There are 3 observation decks within the refuge which are fantastic locations for photography and panoramic views of the Chesapeake Bay. Lodging, food, and other points of interest can be found in the town of Rock Hall, or by returning to Chestertown along the Byway. Stop by the Kent County Visitor Center, located at the intersection of Cross Street and Maple Avenue for a selection of brochures, events, and activities for this region of the Byway. Return to Chestertown via the Byway and resume your birding tour south on Route 213. Continue South on the Byway which becomes Route 18 south of Centreville. In Grasonville, turn onto Perry Corner Road and follow the brown and white signs for CBEC. Chesapeake Bay Environmental Center; Wildfowl Trust of North America, Inc: Formerly known as Horsehead Wetlands Center, this 500 acre tract located on the Chesapeake Bay hosts an extensive collection of waterfowl, birds of prey, and a diversity of bird species along walking trails, ponds, tidal marshes, and woodlands. CBEC hosts educational programs, offers canoeing, birding, and has a visitor’s center, gift shop, and picnic area. Suggested time spent at site: 4 hours, Admission Fee. Return to the Byway, now Route 18 South through Stevensville. Take SkipJack Parkway to Log Canoe Circle to the entrance of the trail loop for Terrapin Nature Park. Terrapin Nature Park/Cross Island Trail Park: This is a linear park that spans Kent Island east to west. The trail affords natural vistas and unique opportunities to view wildlife in an environmentally sensitive designed setting. From the bay waters to the canopied forest, the trail experience offers something for everyone. Lodging, food, and other sites of interest can be found on this lower end of the Chesapeake Byway in Stevensville, Queenstown, and Kent Island. Stop by the Chesapeake Exploration Center in Chester to pick up a variety of brochures for sites, events, and activities for this area of the Byway. 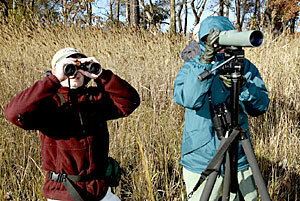 We hope you enjoy your birding adventures along the Chesapeake Byway.